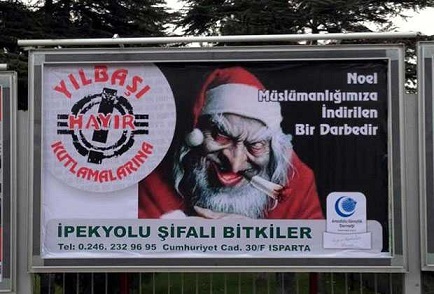 This Turkish sign reads, "Christmas is a blow to our Muslimhood." Anti-Christian hate speech has increased in Turkey in both social and conventional media, reaching extreme levels during the 2016 Christmas season. "The Mosques Are Our Barracks"
Persecution of Turkey's Christian minority has long predated Erdoğan and the AKP. As it stood on the verge of extinction, the Ottoman Empire engaged in mass deportations and massacres that culminated in the Armenian genocide. The end of World War I saw the expulsion of more than a million Greeks, and the position of the dwindling Christian community only somewhat improved in Mustafa Kemal Atatürk's secularist republic. Yet while Kemalist Turkey paid lip service to the equality of its non-Muslim minorities, the AKP unabashedly excludes these groups from Turkey's increasingly Islamist national ethos. An ominous indication of what lay in store for the religious minorities was afforded as early as December 1998 when Erdoğan, then mayor of Istanbul and an opposition politician, announced that the "mosques are our barracks, the domes our helmets, the minarets our bayonets, and the faithful our soldiers," quoting a line from a poem by the nineteenth-century nationalist poet Ziya Gökalp underscoring the Islamist foundation of Turkish identity. And while this recitation landed Erdoğan in prison for inciting religion-based hatred, once at the helm, he steadily realized this vision, systematically undoing Atatürk's secularist legacy and Islamizing Turkey's public space through such means as the government-operated Religious Affairs Directorate (Diyanet), which pays the salaries of the country's 110,000 imams and controls the content of their Friday sermons. The reality is that Turkey is neither a democracy nor a secular republic. There is no division between government affairs and religious affairs. There's no doubt that the government uses the mosques to get its message across to its grassroots supporters. There is an atmosphere in Turkey right now that anyone who isn't Sunni is a threat to the stability of the nation. Even the educated classes here don't associate personally with Jews or Christians. It's more than suspicion. It's a case of let's get rid of anyone who isn't Sunni. Anti-Christian incitement continued apace after the coup. 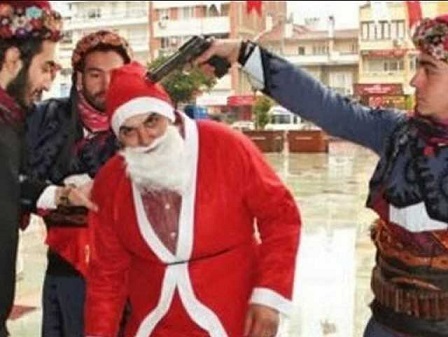 In February 2017, Turkey's Association of Protestant Churches released its annual "Rights Violation Report," which claimed that anti-Christian hate speech had increased in Turkey in both social and conventional media, reaching extreme levels during the 2016 Christmas season. Churches in particular faced serious terror threats with the government doing little to stop these open Christophobic displays. Our purpose is for people to go back to their roots. We are the Muslim Turkish people who have been leading Islam for thousands of years. We will not celebrate Christian traditions and disregard our own traditions like Hıdrellez, Nevruz, and other religious national holidays. In the city of Van, a billboard read: "Have you ever seen a Christian celebrating Eid al-Adha? Why are we celebrating their festivals?" A group of students at Istanbul Technical University held up signs that read: "Do not be tempted by Satan. Do not celebrate New Year"; "There is no Christmas in Islam"; and "In Muslim lands, people are trying to stay alive; in their lands, it is all about festivities." Those who question the party line are labeled "betrayers" and "pawns" of Western powers. Young people are told that we are a country surrounded by water on three sides and enemies on all four. As paranoia, distrust, and fear intensify, the culture of coexistence dissolves. The post-coup anti-Christian rhetoric has tended to follow a familiar pattern, namely that Christian Turkish citizens are not real Turks but are instead loyal to the West. The rhetoric conflates many different streams of Western thought: The secular reveler who embraces the New Year's tradition and the pious Christian who celebrates Christmas are equally suspect. Such rhetoric would not be quite so dangerous if the Turkish media offered a counterargument, but with the government's mass incarceration of all those remotely critical of the AKP and Erdoğan, it is unlikely that any viable alternative will be presented to the Turkish public. embraced an alarming narrative of scapegoating Turkey's religious minority and connecting the coup plot to them … Particularly pro-government media outlets have taken an anti-U.S. and anti-EU attitude, which I can call a xenophobic attitude, in which they attempt to demonize the West and accuse it of the coup attempt. And this narrative targets and harms non-Muslims in Turkey. While the idea that Christian Turks are collaborators with the West is nothing new, the uncritical mass acceptance of such a narrative has exacerbated the coup's effect on Turkey's Christian minority. According to American anthropologist Jenny White, the educational system in Turkey has for years promoted a distrustful view of Christian Turks and the predominantly Christian West. This perception of Christian Turks as the "other" can best be understood by reviewing the curriculum of security courses that were mandatory for all high school students from 1926 until January 2012. Taught by active or retired military officers appointed by the local military base, such courses articulated the idea that Turkey has no friends and that no country in the world wants it to be strong. Security textbooks often presented non-Sunni citizens as divisive, internal elements supported by Turkey's enemies. A similarly stark picture is painted by anthropologist Ayşe Gül Altınay. Having observed classrooms around the country, Altınay found almost no discussion of peace, coexistence, dialogue, or nonviolence. Instead, students were taught to fear differences and to treat their non-Muslim friends as decidedly the "other." The educational system in Turkey has for years promoted a distrustful view of Christian Turks and the predominantly Christian West. Students are taught to treat their non-Muslim friends as the "other." It is our duty to fix what has been perceived as wrong. This is why the Islamic law class and basic fundamental religion class will include [lessons on] jihad. Loving your nation is the real meaning of jihad. According to White, not only the education system but also government organizations and the military perceive Christians as a threat to Turkish unity. For example, until recently, both the official website of the army chief of staff and the Diyanet listed missionary activity as one of the main threats facing Turkey. In 2001, the National Security Council identified Protestant missionaries as the third-largest threat facing the nation. Three years later a report by the Turkish armed forces accused Protestant missionaries of planning to pass out a million Bibles and to convert 10 percent of the Turkish population by 2020, and urged cooperation among governors, mayors, and security and education personnel to counter the danger. In a 2005 article in its monthly magazine, the Diyanet warned that while missionary activities appeared innocent, their object was to divide the country, undermine its unity, and make Turkish citizens tools of their dark ambitions. In a further indication of this trend, the Syrian Christian co-mayor of Mardin was asked to step down from her post by the Turkish government in November 2017. Likewise, the Turkish authorities removed an Assyrian sculpture from a public square in front of the local council building in Diyarbakir. No explanation was given for the removal of either the sculpture or the co-mayor, who was replaced by an official appointed by the government. In reality, the alleged threat that Turkey could become a Christian nation is readily belied by the country's demographics, especially when looking at changes in domestic religious affiliation over the past century. According to the Ottoman census, Turkey's Christian minority was just under 20 percent of the population in 1914. By 1927—a mere thirteen years later—Christians made up less than 2.5 percent of the population. Today Christians make up less than 0.2 percent of Turkey's population of 80 million. (Included in that number are an estimated 45,000 Christian refugees fleeing ISIS persecution in Iraq and Syria.) In fact, even the puny 0.2 percent estimate may be a little high. The official census puts Islam at 99.8 percent of the adopted religion of Turks and 0.2 percent as "other" (mostly Christians and Jews). Like other Islamic-majority states, the rights of Christians in Turkey have never been the same as those of the Muslim majority—not in the Ottoman Empire and not today. Modern-day laws remain biased in favor of Muslims. Church buildings are not allowed to be taller than certain heights while enormous mosques are built on the highest hilltops. Christian worship services are only permitted in "buildings created for the purpose." Turks who openly discuss Christianity face harassment, threats, and imprisonment. Most churches are surrounded by high walls and protected by 24-hour guards. There is a rising undercurrent of intolerance toward Christians and other non-Muslims in Turkey and this goes further than boys standing on the walls of [the] churchyard shouting "Allahu Akbar." We Anglicans have been here since 1582 and yet we're not able to build churches except for a short period in the nineteenth century. And now it's very rare that you hear of a Christian community being able to build a church. Added to such obstacles is the threat of Islamist extremists targeting churches, which increased dramatically after the coup attempt. According to Umut Şahin, secretary general of the Union of Protestant Churches and a pastor in Izmir, "Some people sent death threats to the mobile phones of 15 pastors. They used the same terms and arguments as ISIS in their text messages. They sent the pastors propaganda videos of ISIS." Protestant church leader Ihsan Ozbek revealed that some churches have canceled Sunday services because of fear of an ISIS attack. "This has created deep fear and panic in our community," he said. Turkish authorities have appropriated the church property of Christian Turks. The 1,700-year old Armenian Surp Giragos Church, one of the largest Armenian churches in the Middle East, was seized by the government in 2016. In some cases, the government or local town councils have appropriated the church property of Christian Turks. In April 2016 for example, the authorities seized all the churches in the majority Kurdish southeastern city of Diyarbakir. The historic Armenian Surp Giragos Church, a 1,700-year old church and one of the largest Armenian churches in the Middle East, was seized by the government. And while the government justified the move by the need to rebuild and restore the city's historic center after ten months of bitter fighting against the PKK (Kurdistan Workers' Party, Partiya Karkerên Kurdistan), many within the Christian community were skeptical of the explanation. 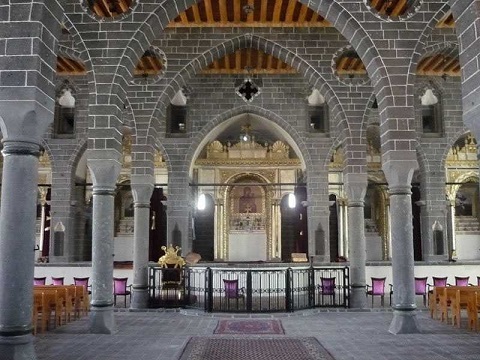 The Diyarbakir Bar Association, representing Christians worshipping at one of the churches, filed an appeal over the action. The Turkish government also recently seized multiple properties in the southeastern city of Mardin belonging to Assyrian (Syrian) Christians and transferred them to public institutions: Dozens of churches and monasteries were reassigned to the Diyanet; cemeteries were transferred to the metropolitan municipality. This seizure of church property is one of many indications that the government does not view Christians as part of the broader Turkish community. Leave all your belongings—your furniture, your beddings, your artifacts. Close your shops and businesses with everything inside. Your doors will be sealed with special stamps. On your return, you will get everything you left behind. Do not sell property or any expensive item. Buyers and sellers alike will be liable for legal action. …You have ten days to comply with this ultimatum. The exact extent of confiscated properties during this period of mass extermination of Armenian Christians is unknown. But according to the private documents of Talaat Pasha, the Ottoman interior minister and chief architect of the confiscation legislation, a total of 20,545 buildings and 267,536 acres of land were confiscated by the government as well as agricultural land: 76,942 acres of vineyards; 703,941 acres of olive groves; and 4,573 acres of mulberry gardens. During the Paris Peace Conference of 1919, an Armenian delegation estimated the worth of material losses suffered by the Armenian Church at $3.7 billion (about $51 billion today). A century later, Turkey's civil codes still give the executive far-reaching powers to confiscate property on the basis of protecting "the national unity" of the Turkish republic. Under Erdoğan's leadership, especially after the 2016 coup, Turkey's religious minorities find themselves marginalized and isolated from the Sunni majority. Anti-Western and anti-EU rhetoric often morphs into rabid anti-Christian incitement with the clear message that the country's Christian citizens are not true Turks, a message that the state-controlled media and government officials have either actively promoted or refused to denounce. Exacerbated by government policies such as the addition of jihad teaching to the school curriculum, these measures place Turkey's non-Muslim minorities in an increasingly precarious situation. Anne-Christine Hoff is an assistant professor of English at Jarvis Christian College in Hawkins, Texas. Fehim Taştekin, "Turkish genealogy database fascinates, frightens Turks," al-Monitor (Washington, D.C.), Feb. 21, 2018. Renée Hirschon, ed., Crossing the Aegean: An Appraisal of the 1923 Compulsory Population Exchange between Greece and Turkey (Oxford: Berghan, 2003), p. 6. John Eibner, "Turkey's Christians under Siege," Middle East Quarterly, Spring 2011, pp. 41-52; Daniel Pipes, "Dhimmis No More: Christians' Trauma in the Middle East," danielpipes.org, Jan. 2018. Deborah Sontag. "The Erdogan Experiment." The New York Times Magazine, May 11, 2003. The New York Times, July 17, 2016; al-Monitor, July 25, 2016. Ayaan Hirsi Ali, "The Global War on Christians in the Muslim World," Newsweek, Feb. 6, 2012. The Express (London), Apr. 22, 2016. Turkish Association of Protestant Churches Human Rights Violations Report, 2016, South Hadley, Mass. Hürriyet Daily News (Istanbul), Dec. 29, 2016. Elif Shafak, "The Reina atrocity shows how deeply fanaticism has taken hold in Turkey," The Guardian, Jan. 3, 2017. See, for example, "A Gruesome Christmas under Islam," ryamondibrahim.com, Jan. 18, 2016; "Death and Destruction on Christmas: Muslim Persecution of Christians, December 2016," raymondibrahim.com, Mar. 13, 2017. The Guardian, Jan. 1, 2017. Shafak, "The Reina atrocity shows how deeply fanaticism has taken hold in Turkey." The National Herald (New York), Sept. 28, 2016. Voice of America News, Sept. 25, 2016. Jenny White, Muslim Nationalism and the New Turks (Princeton: Princeton University Press, 2013), pp. 80-101. The Independent (London), July 18, 2017. Uzay Bulut, "Turkey Uncensored: The Fate of Assyrian Christian Churches and Monasteries," The Philos Project, New York, July 13, 2017. "Attacks hint that Christians may fare worse in post-coup Turkey," Iraqi Christian Relief Council, Glenview, Ill. Aug. 23, 2016. "Turkey, People and Society," CIA World Factbook (Washington, D.C.: CIA Office of Public Affairs, Mar. 16, 2018). "Is Ataturk's dream of a secular Turkey lost?" Belief Net News (Virginia Beach), accessed Mar. 3, 2018. Alec Marsh, "The war on Christians is extending into Turkey," The Spectator, July 19, 2016. Burak Bekdil, "Red Alert! Protestant Couple 'Security Threat' to Turkey!" The Gatestone Institute, New York, Oct. 22, 2016. The New York Times, Apr. 23, 2016. The Express, Apr. 22, 2016. Agos (Istanbul), June 23, 2017. Uğur Umit Ungör and Mehmet Polatel, Confiscation and Destruction: The Young Turk Seizure of Armenian Property (New York: Continuum International Publishing Group, 2011), p. 69. Taner Akçam, A Shameful Act: The Armenian Genocide and the Question of Turkish Responsibility (New York: Metropolitan Books, 2007), p. 86. Vahagn Avedian, "State Identity, Continuity and Responsibility: The Ottoman Empire, the Republic of Turkey and the Armenian Genocide," European Journal of International Law, 2013, no. 3, pp. 797-820. Mehmet Polatel, Beyannamesi: Istanbul Ermeni Vakıflarının el konan mulkeri (Istanbul: Uluslararası Hrant Dink Vakfı Yayınlari, 2012), p. 69.